Vivaldi has been around for more than a year in the alpha and beta stages, but it recently hit the version 1.0 milestone. Founded by ex-Opera chief Jon von Tetzchner, it’s squarely aimed at power users, meaning its loaded with extra features for browsing pros. It’s available for Windows, Mac and Linux too. 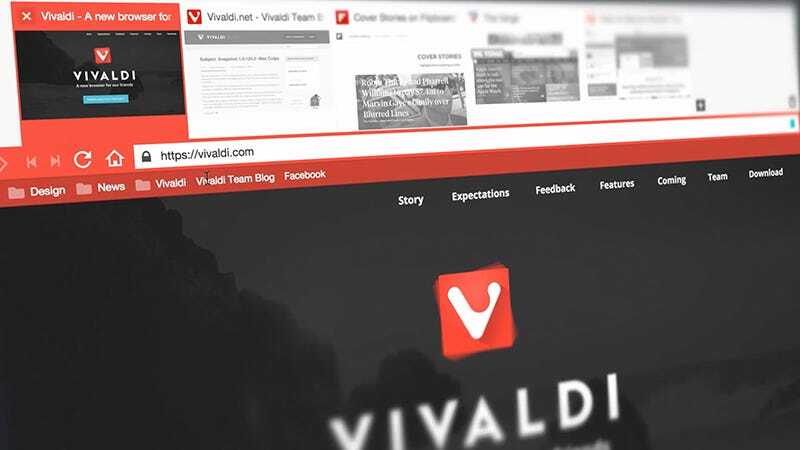 Here are five reasons we prefer Vivaldi over any other browser. We’ve all been stuck in browser tab hell before: That moment when you’ve opened way too many tabs up in your browser, and you can’t find that one website you were just looking at. Vivaldi has a great feature called Tab Stacking that tries to prevent that from happening. Tab Stacking lets you create ‘folders’ of tabs (like folders of apps on your phone’s home screen). Just drag one tab on top of another and you’ve got yourself a tab stack. You might want to group together tabs from the same site, for example, or tabs that are centered around the same topic. You can keep all your social media tabs in one stack and all your work-related tabs in another stack. Right-click to remove a particular tab from the unstack or to unstack all the tabs at once. Please note: This isn’t for annotating webpages. The notes stay fixed as you jump from site to site—but you can attach URLs for reference and each note is stamped with a time and date, too. You might not realize how much you could use a small notepad in your browser’s sidebar until you start using it. Another key feature in Vivaldi is Quick Commands, which look a lot like Spotlight on the Mac. Hit F2, start typing, and you can quickly search the web, your recent history, and your bookmarks. It’s similar to the way the Chrome omnibox works, but the F2 keyboard shortcut makes it even easier to use. The Quick Commands box can also be used to search for keyboard shortcuts and menu items (like History). At this point, it’s also worth mentioning that Vivaldi supports customizable keyboard shortcuts if you want to create your own. Head to the Keyboard tab in Settings to customize your own. Just like Opera, Vivaldi supports mouse gesture shortcuts, so you can close a tab with the swipe of a mouse, or open up a new one with a flick. If you’ve never used it, it sounds a little gimmicky, but once you’ve become accustomed to browsing the web with a few mouse swipes, it’s hard to go back. From the Settings dialog, select Mouse and you can enable or disable mouse gestures and see the gestures themselves demonstrated on screen. For example, to close a tab, click and hold the right mouse button, then drag down and to the right. As yet there’s no option to add your own gestures. Vivaldi also excels in the way it allows you to view sites side-by-side in the same browser window. Select multiple tabs using Ctrl or Cmd and then pick a layout from the Page tiling icon at the bottom (just to the left of the image setting icon). Pages can be tiled horizontally or vertically or in quarters. It works for tab stacks too, so if you want to get two articles up side-by-side then it’s an easy way of doing so. Another click on the same icon gets you back to normal. If you’re using Windows, then you’re probably already comfortable with snapping browser windows to a grid, but this is a useful alternative. There’s plenty more to explore in Vivaldi, including tab thumbnails, a rewind button that goes back to the first page in a tab’s history, support for Chrome extensions, and tons of customization options. There’s still a lot that’s missing too, but this is a promising start—and well worth checking out.